but I think it looks kinda silly. Update: I've been told this looks just like a Pokemon Caterpie. I had never heard of one of those, but that was enough information for me to be able to find the real caterpillar name. 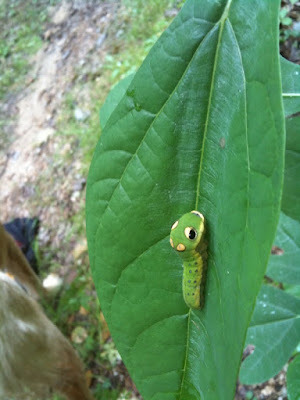 It's a spicebush swallowtail caterpillar. You can read more about it here. While we're on the subject of strange insects... I finally identified the wasp I saw the other day. It's a Cicada Killer Wasp (important to note: not a killer of humans). It was the size of a small aircraft!!!!!! !